About "Madani In’amat Desktop Application"
This software has been developed by the IT department of Dawat-e-Islami for Windows users. 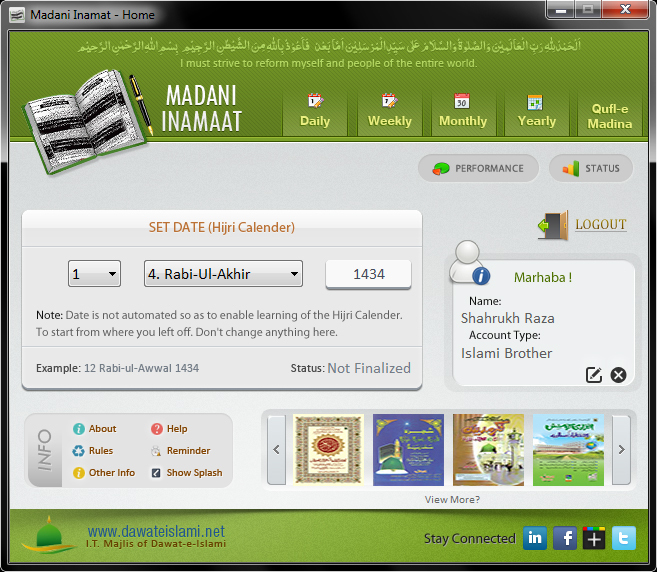 This software is collection of different Madani In’amat. 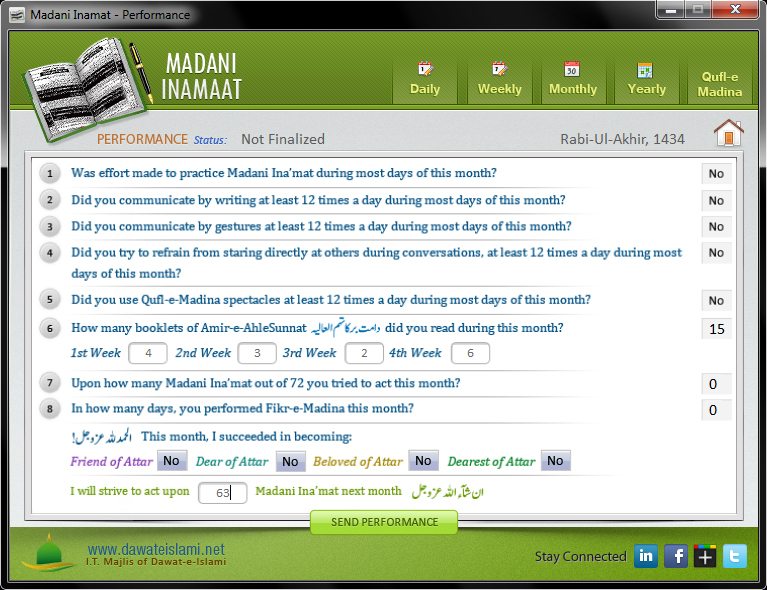 By using this software, Islamic brothers can check their daily routine and can improve their Islamic way of life. Following are the listed items included in this software. 72 Madani In'amaat is for Islamic brothers. 63 Madani In'amaat is for Islamic sisters. 92 Madani In'maaat is for Male students. You just need to make an account for daily, weekly and monthly performances. You can compare and assess your religious performance with the previous one. This software supports four different languages including Arabic, English, Urdu & Hindi. Once the account is created in the software, user can resume his previous record easily. Below is the list of features in this software. It is simple to use and has pleasing interface. You can start from a point, where you left previously. 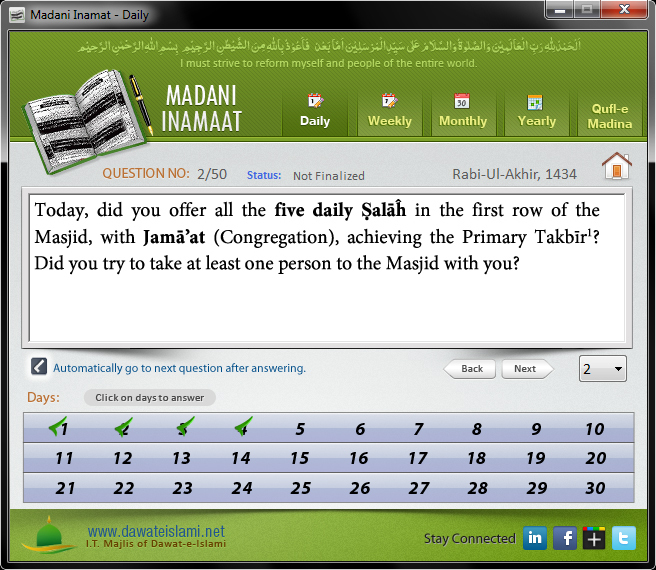 You can fill Madani In’amat Daily, Weekly, Monthly, Yearly & Qufl-e-Madina sections. You can View and finalize monthly performance (Karkardagee). Performance to Nigraan (Via Outlook, Default E-Mail Client or SMPT) can be sent. Portability - Just Copy the Madani Inamat Folder into a Pen Drive, You can now run Madani Inamat Directly from the Pen Drive on any Computer. (By default this folder is located in 'C:\Program Files\Dawat-e-Islami\Madani Inamat\') – Make sure the computers have Net Frame work 2.0 Installed. Complete Data Integration Across Platforms (When Madani Inamat gets launched for Mobile phones, iOS Devices, Windows Mobile and Android devices, you can shift your user accounts to and from different devices and computers. Remember and Save Complete History of Your Madani Inamat Activities. 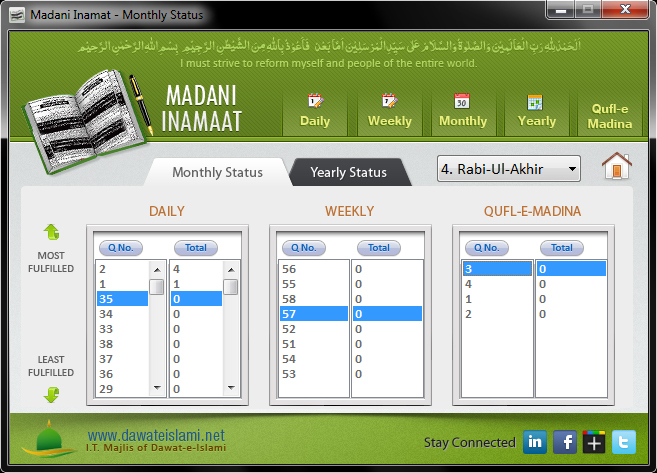 (View Madani Inamat activity for any date by giving the specific date in the home page and by clicking the respective tabs). Create Student (Jamia) Brothers/Sisters (Munnay/Munniyan) & Deaf Accounts. View Madani Inamat Questions in more languages. Use this software by yourself and let other Muslim brothers know about this. Your valuable comments and feedback at support@dawateislami.net will be highly encouraged.